Freedom of the press, on a global scale, is under threat. From the alleged Saudi assassination of Washington Post journalist Jamal Khashoggi at its consulate in Turkey, to the US President’s ban of CNN correspondent Jim Acosta from the White House, the ability of media to criticize power can carry heavy consequences. Trust in the press is fading too. The Varsity itself had to grapple with issues of trust following criticism of our coverage of Jordan Peterson in the fall of 2016. Beyond campus, ‘anti-establishment’ forces accuse and dismiss mainstream media of ideological bias. In the US, outlets like CNN and The New York Times are labelled “fake news” and “the enemy of the people” by some on the right. In Canada, some call to defund the CBC. Though not necessarily new, this is undoubtedly a dangerous environment. Journalists play an important role for the public in uncovering truth and holding power to account. They should be valued and protected. However, this narrative of an oppressed press — which is important — must be coupled with an otherwise neglected story: that of race in the newsroom. Internal power dynamics demand as much scrutiny as external ones. In fact, racial equity can help media to better fulfil its role and legitimacy in the eyes of the public. Freedom of the press comes with a responsibility to tell untold or undertold stories and bring underheard storytellers to the centre. In engaging in more self-reflection on its shortcomings, the media can take a step toward improving its commitment to the public interest and regain legitimacy. The departure of reporter Sunny Dhillon from The Globe and Mail in late October exemplifies the importance of discussing race and journalism in a Canadian media landscape that is largely white. The obsession with ‘objectivity’ is flawed because the very same ‘objective’ reality — such as the Vancouver municipal election — can be covered differently, based on who the reporter is. One’s personal identity, which includes race, class, gender, and more, cannot be divorced from one’s professional journalism. Identity informs what is valued, reported, discussed, and published. But it’s not that this nexus is a shortcoming and that we should strive for total ignorance of colour. It is instead what makes the presence of journalists of colour so crucial. Representation in the newsroom has intrinsic value. Workplaces should look like general society, and they should actively seek to hire people of colour, given the discriminatory tendency of institutions to overlook qualified and competent racialized candidates. But it also has an instrumental value: without it, the media risks insufficiently or inaccurately covering a story or missing a story entirely. This is as much about self-interest as it is about racial justice. Last week, a Guardian article noted that “appearance is not the real problem. A democratic media is.” Not only should journalists of colour be ‘included,’ in a numerical sense, but they should take up space, voice, and power in the newsroom to identify gaps in a paper’s coverage and tell stories in a more accurate and nuanced way. In turn, the communities that they reflect can be better represented in media and become a readership that fully trusts such organizations. Media reports also shape public opinion and dialogue. By not reporting on the racial gap in the Vancouver municipal election, the general public was left unaware of the problem. Instead, the public is left with misrepresentative and stereotypical stories that only portray Asians as “foreign real-estate buyers and money [launderers].” Until the media addresses its own race problem, the general public will continue to be misinformed and racism will continue unaddressed. Dhillon’s story headlined because his experience of the fact that what he “brought to the newsroom did not matter” was shared by many other journalists of colour, who feel ignored, silenced, and overlooked when it comes to race. But many continue to endure it all because leaving the newsroom would mean abdicating responsibility to represent what is already so unrepresented. In a follow-up Medium article, Dhillon shared some of these responses from other journalists of colour, which pointed to another side of the issue: they are not just their race. They are also individuals with a diverse range of abilities and interests. They should not be hired to serve as essentialized, go-to ‘ethnic’ reporters. Dhillon’s story should be understood in the context of other Canadian media’s shortcomings on racial equity. In 2017, columnist Desmond Cole, best known for his activism and journalism on anti-Blackness in the Toronto Police, resigned from the Toronto Star. After being told that he wrote about race too often and that journalists can’t simultaneously be activists, Cole ultimately chose “activism in the service of Black liberation” over his column. Writers like Cole are expected to deliver diversity quotas and improve media’s inclusionary image, but when they attempt to reshape journalistic culture and public conversation about anti-Blackness in this country, they are pushed out. As a Varsity editorial noted, media coverage on anti-Blackness had already been disappointing. The loss of Cole, who was also one of the only Black columnists in mainstream Canadian media, made the situation even worse. Around the same time, prominent Canadian media figures defended disgraced Hal Niedzviecki in the ‘appropriation prize’ controversy. He had encouraged writers to “imagine other peoples, other cultures, other identities” in their work. This swiftly drew criticism from Indigenous peoples, given the connection between cultural appropriation, Canada’s colonial history, and the record of Canadian media in the misrepresentation and exclusion of Indigenous communities and voices. 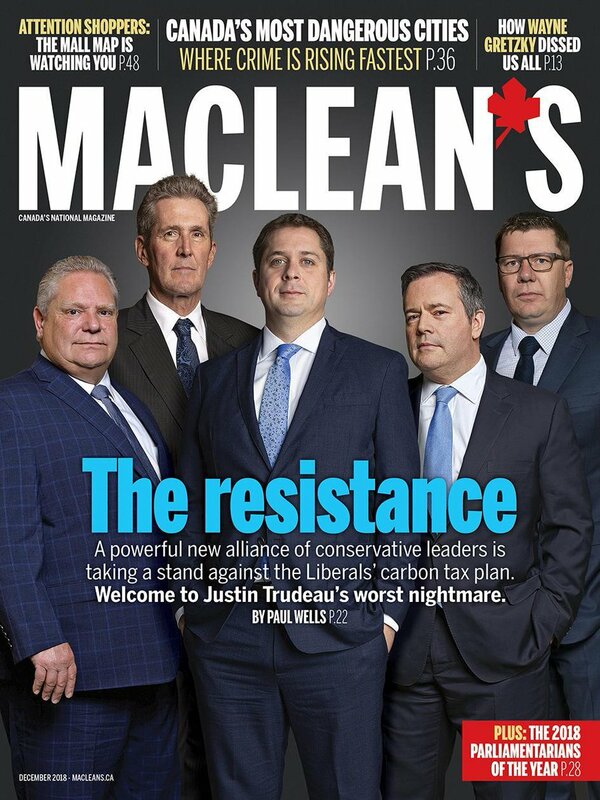 Last week, Maclean’s released the cover of its December issue, which unironically represented white Conservative Party leaders as “the resistance” to Prime Minister Justin Trudeau’s carbon tax plan. This decision dangerously reinforces the view of many far-right figures and movements today that white conservatives are oppressed and marginalized in this country. Furthermore, it co-opts the struggle of actually marginalized communities — queer folks, Black people, Indigenous communities — who are the real resistance in Canada to establishment leaders. It is clear that Dhillon’s story is not isolated. Canadian media organizations must do much better in deciding which stories to tell and who to tell them — especially when it impacts how the public understands the world around them. In a Globe and Mail piece this summer, Amy O’Kruk, former editor-in-chief of Western University’s Gazette, Western University’s student newspaper, commented that for mainstream media, doing better on diversity starts with, and should draw inspiration from, student papers. After all, whereas columnists in Canada are mostly cisgender, straight, white men, student paper mastheads do better with representation. However, this should not be cause for celebration alone. As Victoria College’s The Strand noted in an editorial last month, student journalism should strive not just to be accurate, but equitable. As student journalists, many of us are the future of Canadian media — and therefore we have a responsibility to be the generation that does better on equity. At The Varsity, we realize that we are no exception when it comes to journalistic fallibility. Although we are proud of our diverse masthead, our reporting and publishing can and has come up short for underserved communities in recent memory. We realize that the presence of journalists of colour must be qualified with power. We continue to strive to improve our newsroom culture and practices in order to better empower marginalized voices, including by building relationships with those communities. We know that what we cover — and don’t cover — has implications for student public opinion, and we don’t take that responsibility lightly. Today, the press is threatened on multiple fronts. On the one hand, powerful actors seek to undermine the legitimacy of and trust in media. On the other hand, the press is undermining its own legitimacy when it fails to serve marginalized communities. This is especially concerning because, with the global growth of the far right, race and identity are increasingly at the heart of all things political. Media must therefore strive for sensitive, responsible journalism when it comes to race — more than ever. And it starts with internal reform. Of course, media leaders should hire and elevate more people of colour to positions of power to ensure that they have a strong voice in the newsroom. But as as a recent J-Source article noted, it is not those at the top who will lead the change. Rather, it is the workers — reporters, fact checkers, designers, photographers — who must collectively organize and demand change for a more equitable workplace. They are to whom the newsroom belongs. When the Globe editor said to Dhillon that there is no democracy in the media, she wasn’t wrong. But there should be. Let’s start by putting more colour in our print.